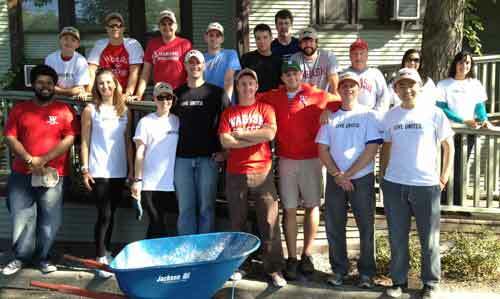 Alumni of the Wabash Club of Chicago partnered with colleagues of Joe Martin ’06 from T Rowe Price and United Way at the YWCA Evanston/North Shore on a warm September morning. The team of 11 Wabash alumni and 7 T Rowe Price employees spent the morning from 9:00 – 12:00 clearing brush, raking leaves and uprooting weeds from the perimeter of the YWCA’s parking lot. The volunteers then joined together in fellowship for lunch at a restaurant in downtown Evanston following the volunteer work.